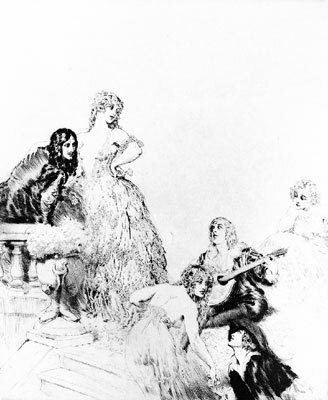 Norman Lindsay new release facsimile Etching titled Light Lyrics is available from March 2007, the image size is 30.5 x 25.3cm with a edition of 550 only. Seventeen of Norman Lindsay etchings published (from a total of 200) are pure dry point that is, not used in conjunction with any other method. The original Light Lyrics is one of these etchings. Etching House from the 29th March 2007 will have available the Etching Facsimile Print titled “The Audience” as well as the Book titled Portrait of Pa. Lay Buy is welcome.